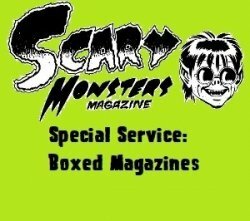 If you are a collector and want your magazine order of four or fewer copies shipped inside a box rather than a cardboard envelope or padded envelope, this special service is for you! This special service is only available for magazines and for four or fewer copies. It is not available for subscriptions. Why is it only available for four or fewer magazine copies? Because, generally, if your order has five or more copies, it will be shipped in a box anyway. You must choose box size at the drop-down menu above. The Priority Region A Flat-Rate Box is larger than the magazines and allows for some cushioning. The Priority Large Flat-Rate Box allows for more packing material and adds an additional $5.00.